Value: With its low fees and great conditions, Red Bridge Golf & Country Club offers one of the best values for your golfing money. Layout: This course is very unique to the Charlotte area and the variety of challenges feels almost thrilling, like a roller coaster ride. The layout features five par 5’s and five par 3’s. Many holes feature significant elevation changes and rolling hills, giving the course a mountain-like feel. Greens: Velvety MiniVerde Bermuda grass and often rolling fast. Several greens have two tiers or severe slopes that can lead to some diabolical pin placements. Indeed, the annual “Superintendent’s Revenge” tournament is not for the faint of heart. Memorable holes: Par 4 17th hole — a short, downhill, dogleg right requiring a precise approach shot to a small green protected by a pond. The par 5 18th hole is notorious for being one of the longest and toughest holes in town. It’s 619 yards from the men’s tees (650 from the tips) and requires an uphill, hazard-crossing final swing of at least 120 yards. You may love it or hate it but this course is a must play. Wine slushie: The first hole runs alongside Rocky River Vineyards and you’re invited to run in for a wine slushie before you tee off on hole #2. Country club conditions away from the hustle and bustle of the big city. Practice Area: Grass tee driving range with a chipping green, practice bunker, short game area and a putting green. This course is home to one of the better practice complexes around town and hosts clinics and golf camps year round. Getting there: While only a 20 minute drive from south Charlotte, Stonebridge is tucked away from the main highways. So make sure you have a good GPS map to get there the first time. What you’ll find is a beautiful course with a relatively new community building up around it. Only recently, have houses begun to spring up around the front nine. There are still many holes where you will enjoy relative tranquility compared to most country clubs around town. First hole: A par 5 that features the namesake stone bridge to help you cross a creek that splits the fairway. It’s not quite the famed Swilcan bridge at St. Andrews, but it’s a nice touch. Greens: Stonebridge is one of the few public courses remaining with Bent grass greens. Layout: Stonebridge is a fairly flat course, with few sloped or tiered greens. To some that can make it seem relatively easy, but there are challenges like blind doglegs (hole #4) and ponds in play on 6 holes (#7, 10, 14, 16, 17, 18). Two of the par 5’s are imminently reachable in two good shots, including the closing hole. Finishing stretch: Holes 14 through 18 are exhilarating because of the views and the risk-reward. From the par 5 14th fairway you can see the 15th green, 16th fairway and 16th green across the pond. That par 4 16th hole is a great test, with a two-tiered fairway where the bottom tier runs out to a water hazard – so be careful with your tee shot placement. The approach is then over that pond to one of the smaller greens on the course. The par 3 17th hole is all carry over a pond and the par 5 18th protects eagle with a small pond short right of the green. Make it through the final 5 holes without losing a ball in the water and you should feel pretty good. 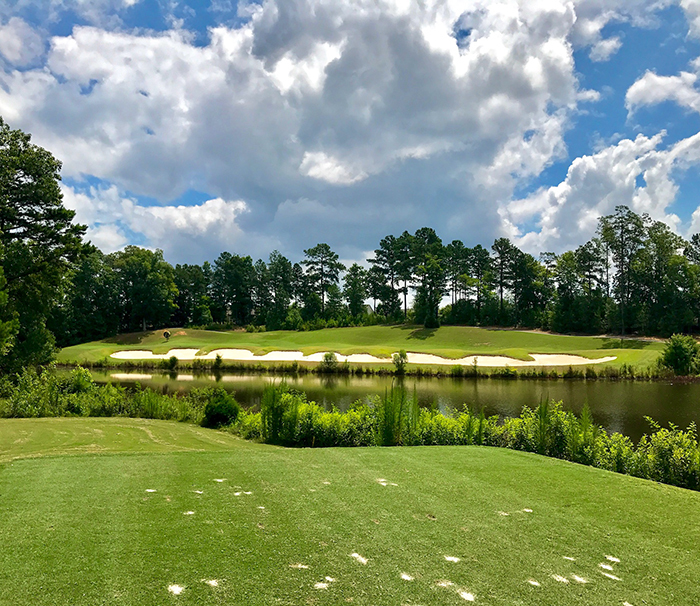 Tucked amongst the majestic pines of the South Carolina countryside in Lancaster, Edgewater Golf Club features the best Bent grass greens of any local public course and a challenging layout worthy of even the most skilled golfers. Edgewater Golf Club offers frequent player discounts and affordable memberships. Practice Area: Grass tee driving range with a chipping green, two practice bunkers and a putting green. Age: Edgewater Golf Club is a young course (2008) that was built within a retirement community that has been developed very slowly – meaning there are still few civilized intrusions on the quaint and natural setting. I love courses like this where you can hear the birds chirping, fish jumping and turkeys gobbling – yes, I’ve seen several on this course. Greens: Edgewater’s A1/A4 Bent grass greens are similar to the A1 Bent grass at Augusta National and they are typically smooth and felt-like all year round. Layout: There are several beautiful holes and lots of scoring opportunities throughout both nines. Just based on my scores (eagle and birdie in my last two rounds), I love the short par 5 17th hole. However, I’d love to skip the seemingly benign par 4 3rd hole. This dogleg right has a tall tree guarding the turn and then a lake that curls around the green, making for difficult tee and approach shots. The website includes a hole-by-hole guide with flyover videos. Drive time: Since the drive can be lengthy from Charlotte, it’s wise to plan a day of it and play 36. You can usually get a good replay rate on your second round. Nice touches: The service here is top notch and there are coolers every 3 or 4 holes that hold complimentary water bottles. Rocky River’s website includes a hole-by-hole strategy guide with flyover videos. 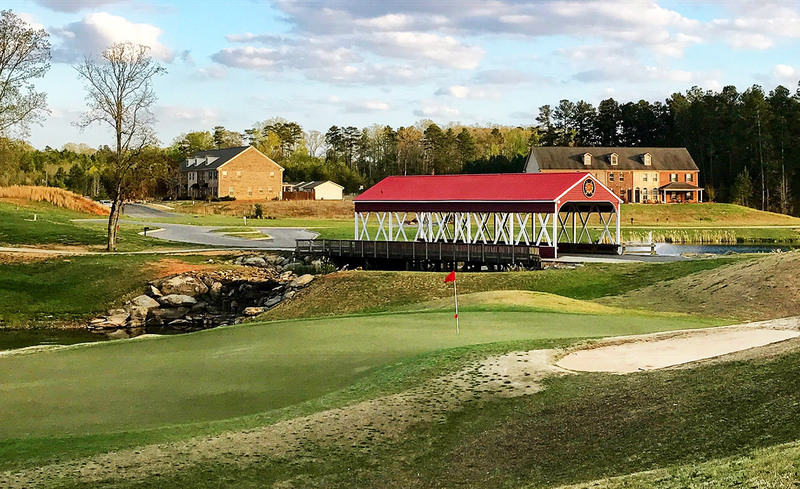 Location: Rocky River Golf Club sits right in NASCAR’s backyard and within earshot of Charlotte Motor Speedway and the zMAX Dragway. Often times, you can hear drivers making their practice runs as you play the first several holes. Layout: The Dan Maples design was renovated with Bermuda greens in 2012. 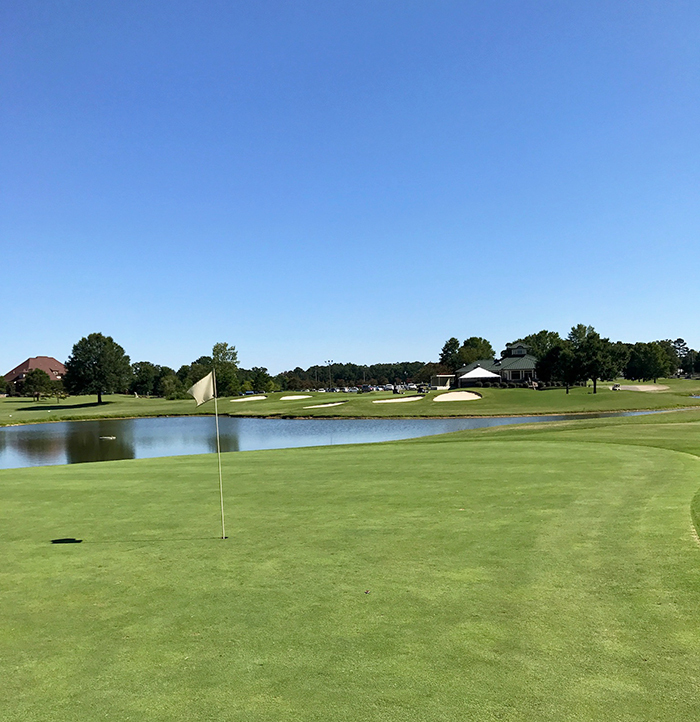 It plays like a resort course, with well-manicured fairways and greens that meander through hills and valleys alongside the Embassy Suites hotel and the hustle and bustle of the Concord Mills area. Several holes require well placed tee shots, as water hazards, wetlands and thick pines will swallow errant shots. Those challenges along with elevation changes and thick Bermuda rough can make this a difficult course to score on. Scoring holes: You’ll need to take advantage of the easier holes, like the short downhill dogleg right par 4 14th hole with those wetlands on the left but out of play. My favorite hole is the par 5 3rd hole that features a humongous boulder in the middle of the fairway – I’ve seen a tee shot bounce off the top and leave less than 150 yards in for the approach. The 18th hole is a tricky, snaking par 5 with trees and bunkers guarding the turns. The approach into 18 plays right in front of the Stonehouse Grille with the zMAX Dragway visible in the distance. Advice: The risk-reward opportunities throughout the course can make for a fun, memorable round. With its combination of great amenities, Rocky River is a perfect spot for family and friends in town for a visit. Discount: Concord residents and Embassy Suite guests can get $10 discounts off the rack rate. 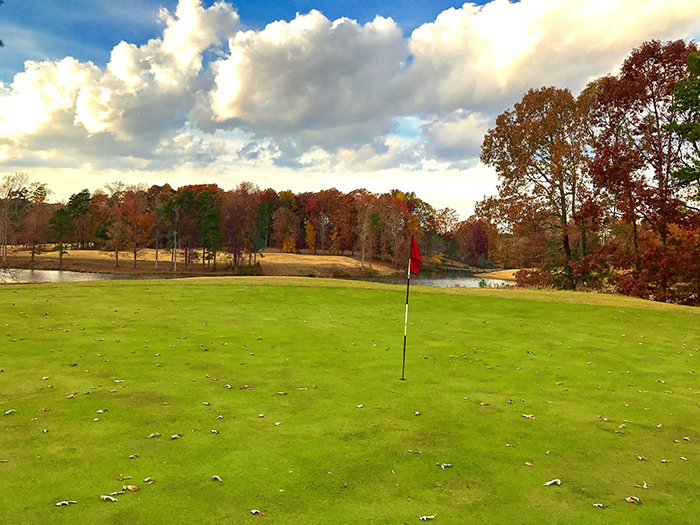 Built around the beautiful 52-acre Lake Wright and convenient to both I-77 and I-85 north of Charlotte, Warrior Golf Club offers beautiful views, rolling terrain and immaculate Bermuda greens. The renovation in 2018 also included removal of almost 2,000 trees to improve sunlight and airflow to each green complex. Early reviews of the renovation say this made the course much more playable for all skill levels. Practice Area: Grass tee driving range with a spacious chipping / bunker practice green and a large putting green. 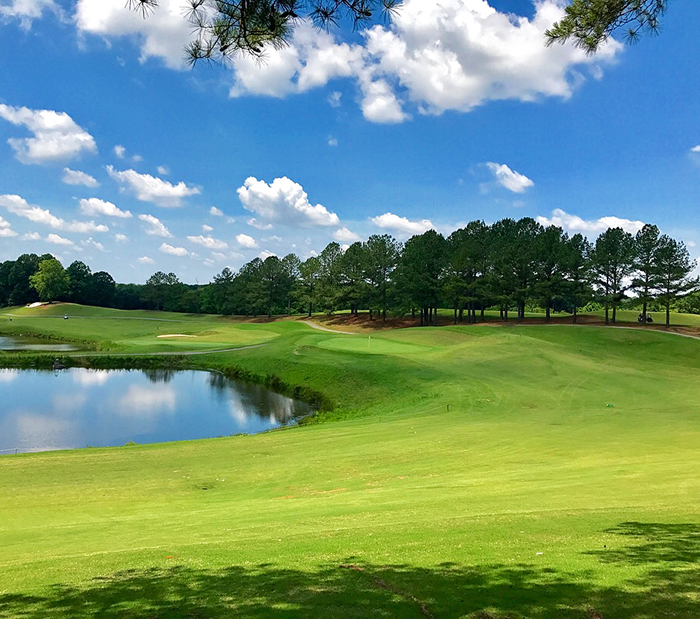 Greens: Warrior Golf Club’s large greens were renovated in 2018 and now feature Champion G12 Ultra Dwarf Bermuda grass. Layout: There are very few flat holes – so if you enjoy rolling hills and sloping fairways, you will love Warrior. 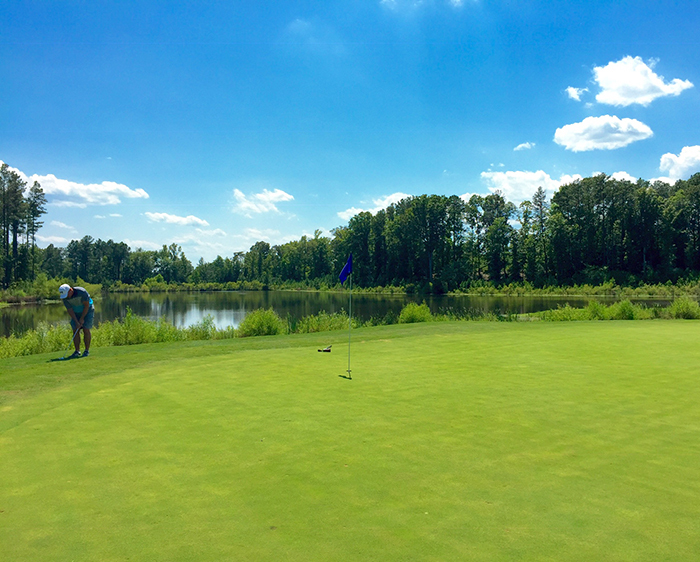 The lake comes into play on several holes and offers great scenic backdrops for your round. The layout includes many scoring opportunities via reachable par 5’s and with three of the five par 3 holes only requiring mid-iron approaches. Favorite hole: Short downhill par 4 15th. Avoid the strategically placed pot bunkers in the fairway and you should have a great view and a short approach shot into the green which backs up to the lake. Hard holes: I despise the 10th hole. This brutal 435-yd par 4 has a small landing area off the tee and then requires a very long uphill approach to a well-protected green. And watch out for the blind 2nd shot on #11 with a large bunker fronting the green. Overall, I love the challenges and the views on this course. Technology: Warrior Golf Club’s golf carts now feature touch screen GPS to aid your distance measurements and course strategy. Secluded: Eagle Chase is hidden among the farms in Union County with no houses or other civilization intruding on your round of golf. Everyone who plays here is reluctant to brag about it because they want to keep it to themselves. Getting there: You’ll need good navigation assistance to find Eagle Chase on your first visit. It’s located in Marshville (where the Academy Award winning movie A Color Purple was filmed). Golf-first: Eagle Chase is all about the golf, with just a simple clubhouse and snack bar to accompany the practice area and 18 hole layout. Greens: The course features Diamond Zoysia grass greens (installed in 2013) that are typically in immaculate shape. Layout: It plays like a mountain course with an elevated tee or green on almost every hole. Both nines have a good mix of difficulty. 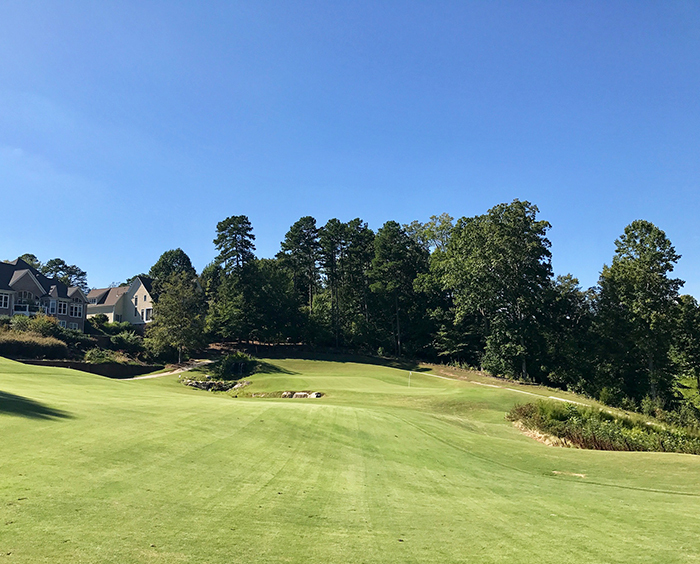 The front includes two reachable par 5’s, a dramatic downhill par 3 (#6), and one of the toughest par 4’s around town. That would be the par 4 2nd hole, which is 412 yards from the elevated back tee with a large pond along the left side and a creek along the right. If you’d give me a bogey on that hole, I’d skip it every time. The back nine features a breathtaking stretch of 3 holes (11-12-13) where the elevation and two ponds make for awesome photo ops. The par 4 13th hole is one of my favorites, only 334 yards from the elevated back tee with a carry over the pond – a great birdie opportunity, with a view. Drainage: With all the rain we’ve had this past year, I can tell you that Eagle Chase drains extremely well. So when it’s a soggy day, know that you can trust this course to be playable at all times. Value: This course is the best value for your money in the area, which should make you feel better about the drive to get there. The only negative that fans of the course will admit to is the cart paths – on many holes it’s best to ride just off of them in the grass to avoid the bumpy and broken concrete. Practice Area: Dual-sided grass tee driving range with a short game practice area including a sand bunker, chipping green and putting green. One of the best practice spots in the area. 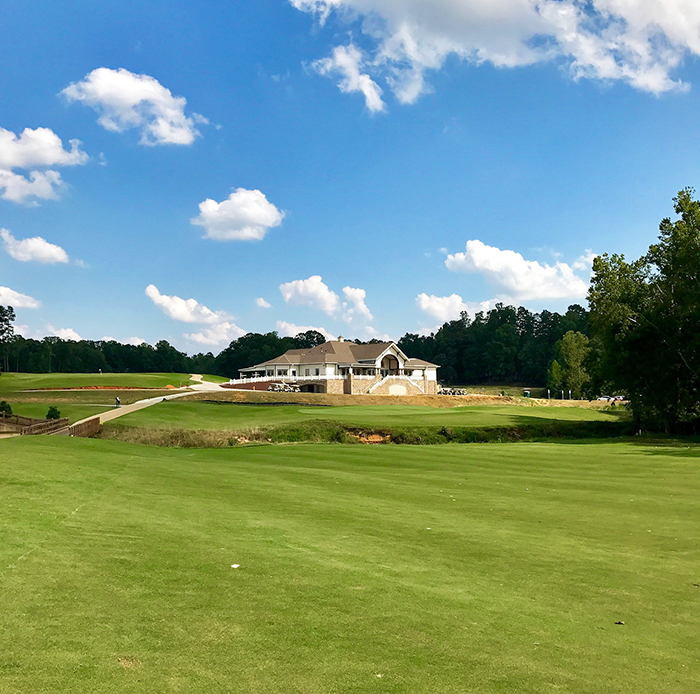 Renovation: Mooresville Golf Club completed a $5 million renovation by Kris Spence in 2016 and is now home to a 17,000+ square foot clubhouse. The course features a new links style layout with TifEagle Bermuda greens. It is very walkable and reasonably priced for the quality of conditions and amenities. When it re-opened, memberships were offered (now sold out) and tee times were a tough score. Greens: The new Bermuda greens are excellent and very challenging. Layout: Among the 18 holes, there are five par 5’s and five par 3’s. I enjoy the unique mix of fun and difficult holes. The downhill par 4 4th hole takes you right into the clubhouse and parking lots – careful you don’t go long on your approach. The par 4 9th hole features a dramatic elevation drop and a long, difficult approach shot over a creek to the green, with the new clubhouse in the background. With the elevation changes, it pays to play your first round here with a veteran who can give you local course knowledge and help you avoid trouble. History: The original layout of 9 holes was designed by Donald Ross and opened in 1948. Party time: The renovated clubhouse now includes On the Nines Bistro and banquet space for 150+ guests. While memberships are currently sold out, they also offer practice membership plans that give you unlimited access to the impressive practice complex. 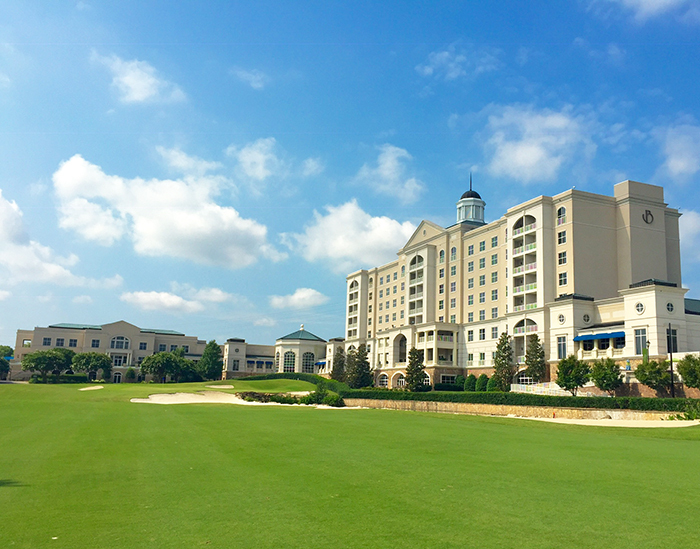 The only resort course in the Charlotte area, The Golf Club at Ballantyne has the best amenities in town and is the premier public course for golf outings or stay-and-play packages. Practice area: Turf mat driving range with a chipping green and a putting green. Ballantyne Golf Academy features additional practice areas and clinics. Best-in-class: The service, amenities and course conditions are all what you’d expect from a pricey resort course but you do get what you pay for here. Greens: The greens were redone with Champion Ultra Dwarf Bermuda grass back in 2009 and are the fastest of any public course in town. The speedy greens can really challenge your short game with thick Bermuda rough surrounding them. Layout: The par 71 layout features five par 3 holes, including the 10th hole with a short iron carry over a pond. The back 9 has three par 5’s, all of which are reachable in two good shots. While scoring opportunities abound throughout the 18 holes, the front 9 tends to play much more difficult, with the par 4 2nd and 6th holes always giving me fits. The signature par 4 finishing hole plays right in front of the hotel and you’ll have often have spectators watching as you play your approach to a two-tiered green with a pond guarding the right side. Hit the green, make your putt and wave to the crowd. Resort setup: The resort also offers spa treatments, tennis, luxurious accommodations and the acclaimed Gallery restaurant. The course is built for golf outings and big tournaments – I play in the Hope Stout Memorial Golf Tournament every Columbus Day. Teaching: The Ballantyne Golf Academy offers lessons for all ages as well as 1-day clinics and 3-day school packages. Practice Area: Grass tee driving range with a chipping green and a putting green. The practice areas are large and perfect for lessons and clinics. The Tavern on the Lakes restaurant looks over the practice area and is top notch. Greens: One of the few public courses in the Charlotte area to still feature bent grass greens. Speaking of the greens they are very large and several are two tiered – making your approach shot accuracy very important. Watch out: With the residential homes lining most of the holes, there is a ton of O.B. to go along with many natural hazards. I consider this course to be one of the most “bunkered” ones around town – hopefully, your sand game is solid. Layout: The course features a wide variety of holes including doglegs, elevation changes, shorter risk-reward par 4’s and reachable par 5’s. There are several unique and picturesque holes that are sure to make for a memorable round. The downhill par 4 11th hole is only 290 yards from the Men’s tees – while it’s worth a go with the driver, there’s a large pond guarding the entire right side. Watch out for the par 3 16th hole with its intimidating 175+ yard carry over water and bunkers from the back two tees. The course is in great shape year round. Value: While the club only offers memberships to Sun City residents, it does have a frequent players program offering discounts to non-residents. One of the most visually stunning courses in the area, Verdict Ridge offers beauty, challenge, conditions and amenities on par with nearby private clubs. Layout: You will find it plays like a mountain course, with steep hills and valleys throughout. You’re likely to have some sidehill and uneven lies throughout your round. The course is generally kept in very good condition year round with fast Champion Bermuda greens. 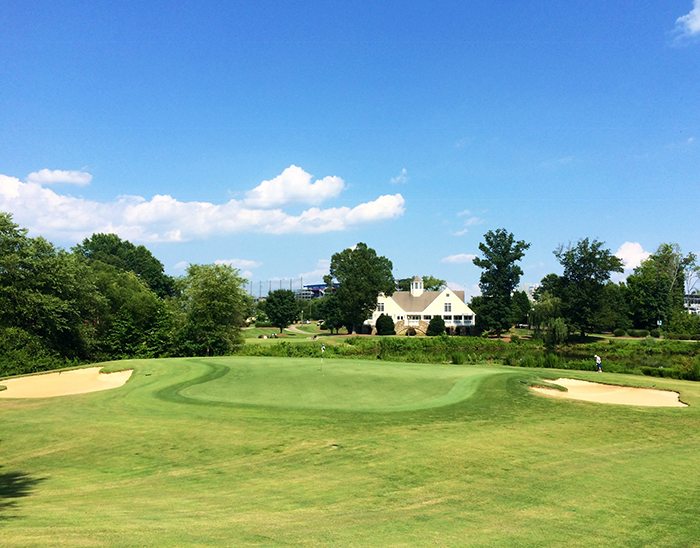 Favorite hole: 347 yard par 4 9th hole — one of the most beautiful in all of Charlotte. With water all along the right side, it’s best to play an iron from the tee off the left slope. Then you have a short iron approach into a green guarded by a small creek on the left and the pond on the right — with a waterfall behind the green offering a scenic backdrop. Watch out: There are several difficult holes with hazards and trouble spots that may not be obvious from the tee. You’ll want to play your first round here with a veteran of the course to give you some tips. Two of the trickier holes in my experience are the long par 4 4th hole and the difficult par 5 18th hole with several hazards to navigate. If you can score well here, you’ve earned it. The course will test all facets of your golf game and you’ll want to keep coming back to see how you measure up. 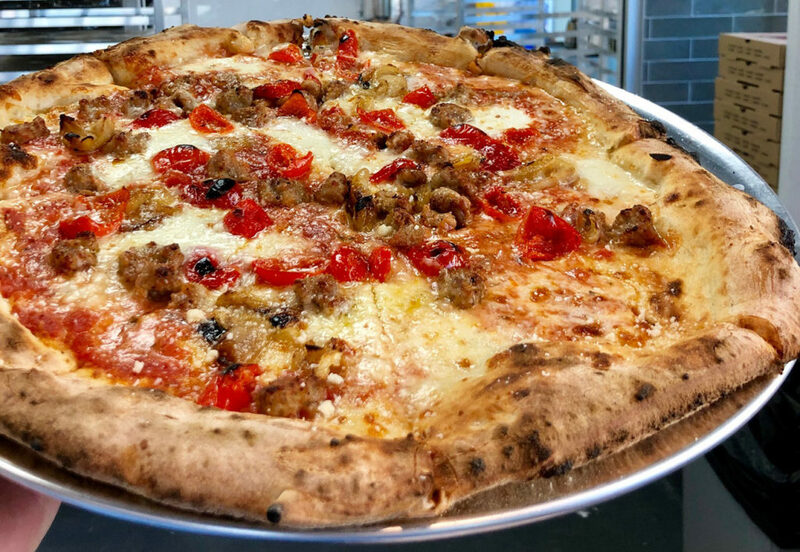 19th hole: Plan to spend some time in Guilties Bistro after the round for dinner and drinks. Value: If you live nearby, check out their different membership options. The club is affiliated with ClubCorp – which gives you reciprocal access to a wide array of upscale private clubs across the country. 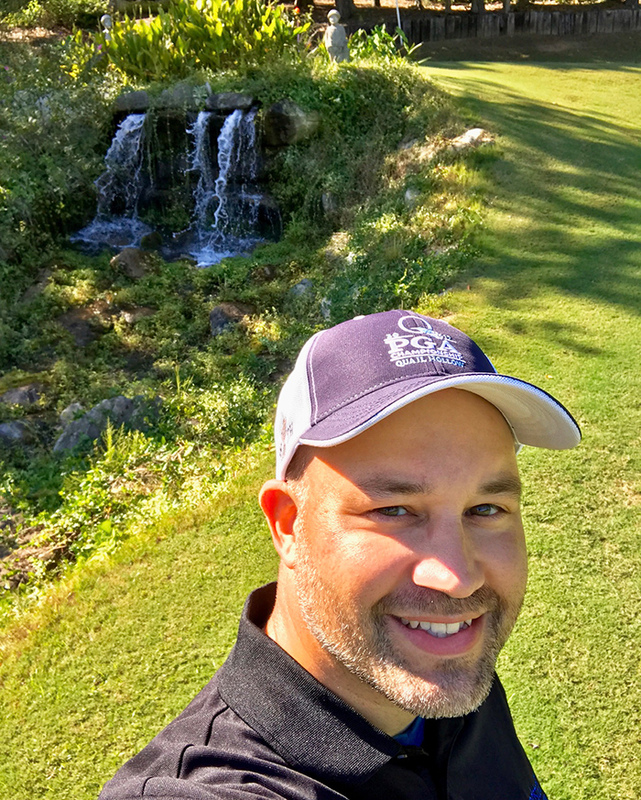 Note: Author Chris Beeman runs The B-Man’s Guide to Golf in Charlotte, where you can find detailed reviews and updates for over 40 public courses within an hour’s drive of Charlotte. 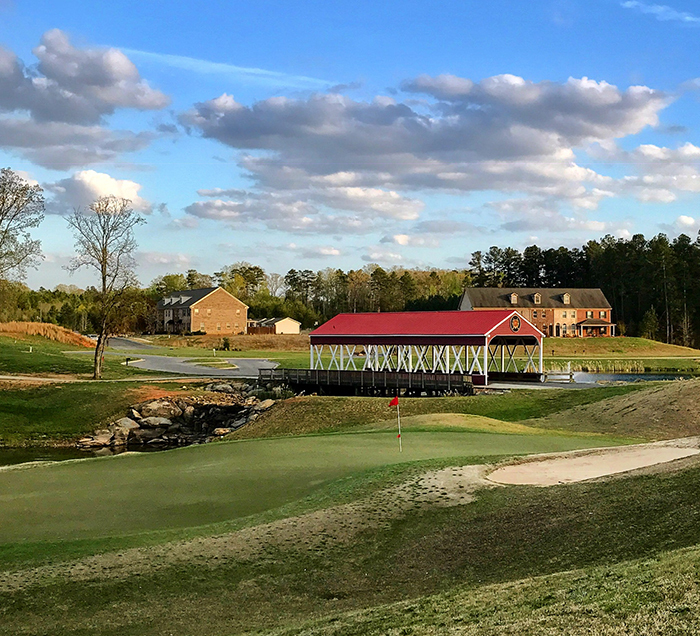 And if you’re in the market for private courses, check out the Agenda’s guide to the 10 best country clubs in Charlotte — including pricing data.